In tall buildings, columns carry huge loads which effectively compress the column along its axis. This is commonly known as ‘axial shortening’. 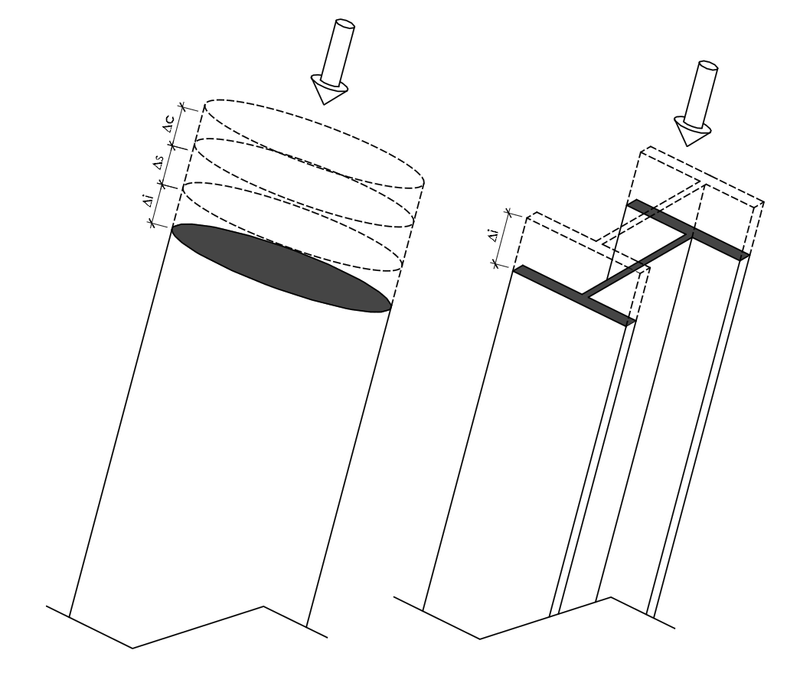 The axial column displacements generate significant forces within the structural elements they support, and can also cause failure of surrounding non-structural elements. 1. Elastic deformation (∆i): Instantaneous deformation that depends on the magnitude of load, strength of concrete and age of concrete at the time of load application. 2. 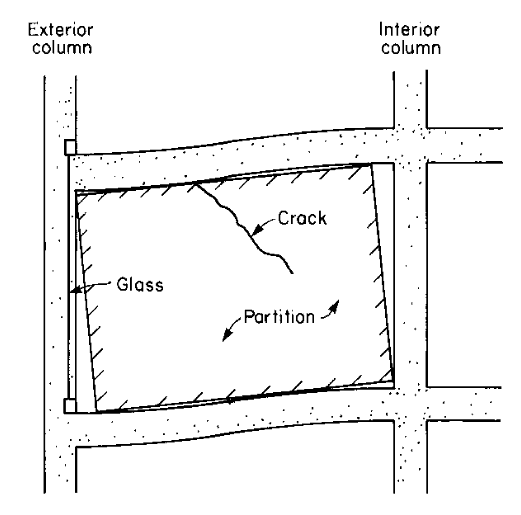 Shrinkage (∆s) and creep (∆c): Time and deformation dependent on concrete properties, amount of reinforcement, volume/surface ratio, ambient humidity conditions, magnitude of sustained load (affects creep only) and loading history. As a rough guide, 40% of the inelastic deformation takes place within the first 28 days, while after three to six months, 60% and 70% of the total deformation will occur, increasing to 90% after two years. 1. Whilst reinforced concrete columns are subject to elastic, creep and shrinkage shortening, steel columns are only subject to elastic shortening (∆i). Note, deformation due to temperature effects differs from other types of shortening as it varies continuously and can produce lengthening as well as shortening for the member. Generally, the main structural concern relates to ‘differential shortening’ which is the relative displacement between the vertical elements rather than the absolute magnitude. Differential shortening in concrete structures primarily takes place between columns and shear walls because of the difference in stress levels, reinforcement ratios and volume-surface ratios. This results in significant differences in creep and shrinkage movements which are cumulative over the height of the building, reaching the maximum vertical deformation at roof level. Potential differential movements must be calculated and properly accommodated in the architectural details, as any restraint to the movement can transmit large forces into the architectural elements. As an example, Figure 4 indicates column shortening having taken place, with insufficiently sized joints being provided between the external blockwork façade. As a result the blockwork becomes load-bearing and is subjected to unexpected compressive stresses which can lead to spalling and crushing of the blocks. At the same time, this differential movement can cause the slab to rotate, developing levelness problems as well as potential damage to floor finishes, services, etc. A similar effect to a glazed façade is demonstrated in Figure 5. Aim to achieve uniformity of compressive stresses and percentages of reinforcement within vertical elements. 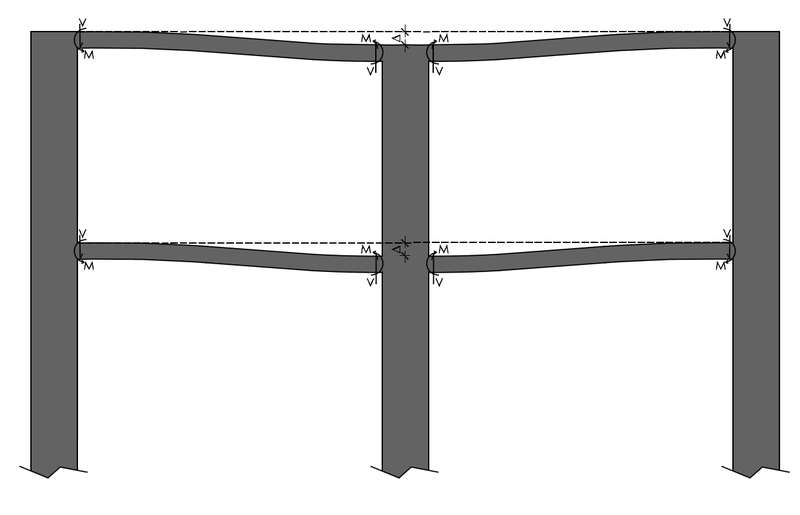 Increase the bending stiffness of horizontal members to limit column shortening. Provide additional reinforcement in columns anticipated to be subject to the greatest magnitude of shortening to increase axial stiffness. During construction of the columns the concrete can be ‘over cast’ to accommodate the expected axial shortening. 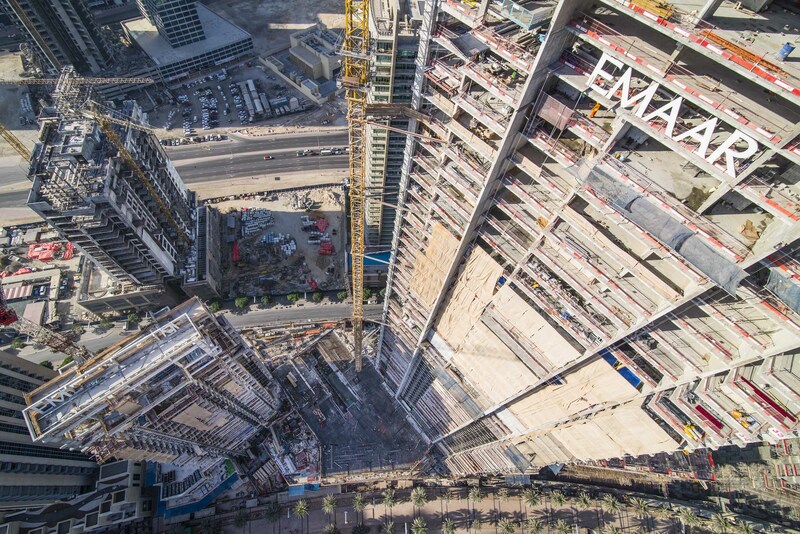 This approach requires an accurate prediction of the anticipated shortening values, on a floor-by-floor basis, as well as highly accurate construction.